For my last science fiction novel I made a research trip to the Titan Missile Museum. 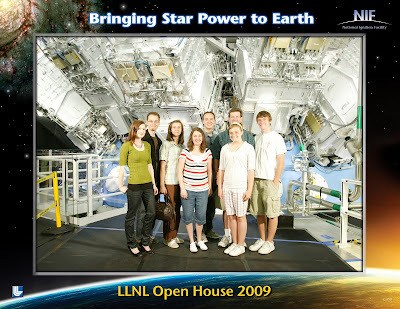 For my next science fiction novel I made a research trip to the National Ignition Facility. Some time in the summer of 2010 they plan to fuse atoms in that big blue cement ball behind me using a laser array the size of two football fields. In my story, the experiment is a success, but twenty years down the road the implications of a fusion powered civilization turn out to be not so pretty. In the photo, I'm the third person from the left. See that brown purse in my hand? The security guards searched it three times that day, every time I went through the main gate. "You're well prepared," the security guard remarked as he dug through my belongings. That was a high compliment coming from a man wearing a bulky black utility vest covered with pockets that contained who knows what kind of national laboratory security guard equipment. "A tape measure, a compass... what's this thing?" "A pitch pipe." I said as he pulled the fat metal disk out of my purse. "You blow into one of those holes there and it sounds a note." The security guard considered this. "It's a musical instrument," the security guard's partner assured him. "I carry it around for singing. I've got my back-up group with me right here." I turned to my brothers, my sister-in-law, and a few friends who were going on the tour with us. "What do you want to sing, guys?" They laughed at me. I was serious. We could have given the guards a good rendition of "Brightly Beams Our Father's Mercy." They let me through, pitch pipe and all. very cute - but i'm sorry they didn't let you sing. it would have made their day!